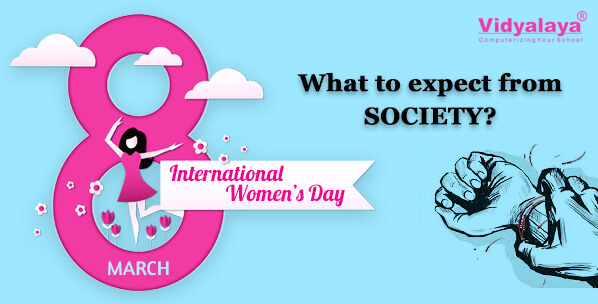 8th March 2018: International Women day-What to expect from Society? Women’s Empowerment is more to give to her by oneself not when she has to fight for it. So what is women Empowerment according to you? Women Empowerment is when she enjoys equal rights of freedom not just in books but in reality too when the decisions she makes are trusted, the leadership qualities are accepted when it’s from her. Then we can say YES my country is actually giving women the rights she deserves. We see leaders, people everyone speaking about social financial, political, psychological, cultural & intellectual development of women but the headlines of rapes, Physical abuse, dowry killing, domestic violence, female feticide & infanticides still puts an unheard question on the society. The gender inequality is the biggest discrimination you can do to a woman while coming on education. Still, in our country, the female literacy rate is less than the male literacy rate. The drop out ratio of girls is also higher after primary education. Though the government of India has initiated many programs for girl’s education still no proper implementation is done on the common grounds. Since ancient times girls are always preferred to do the household tasks & considered on the weaker side of the society in comparison with their male counterpart. As studies say, there are 29 states in our country but only 2 of them are with 100% literacy rate which clearly states the need to educate a woman is always considered less important according to our mentality. As the quote goes “A women with knowledge is a respectable woman, she has the power to make people listen to her and the charisma that makes people follow her.” Same way educating a woman will lessen various social issues in society. From this woman’s day, we at Vidyalaya school management ERP software salutes all woman for their contribution in making our nation proud.